... and uninvited guest. 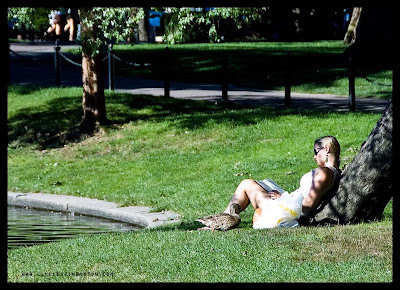 Enlarge the picture and you will see the duck sneaking up on the girl and her food in the bag from "Au Bon Pain". Hey, you've got a new look too. I like it. Love the picture too - I wonder if she noticed in the end? I can sympathise as I tend to get equally absorbed in a good book. That duck sure was encroaching. Nice capture! I assume the duck got the bread, and the girl went back to the book...all's right with the world. This must have been EARLY yesterday, because that ol' man sun made reading, even in the shade, difficult. Whew! Love this capture. . .